HelpHound Blog: Come on businesses - help everyone out! A staffer came into the office last week exclaiming - "Why won't these guys help me to help them?!!" Is it conceivable that businesses will continue to ignore the power of consumer opinions like this for much longer? What did she (our staffer) mean? She explained that she had been driving home from a meeting in the midlands and needed to shop for that evening's meal. Passing through Stratford-upon-Avon she thought to herself "I'm in the heart of England and a rural area renowned for the quality of its produce, I'll park up and spend 5 minutes on Google and find a great butcher and a great grocer." 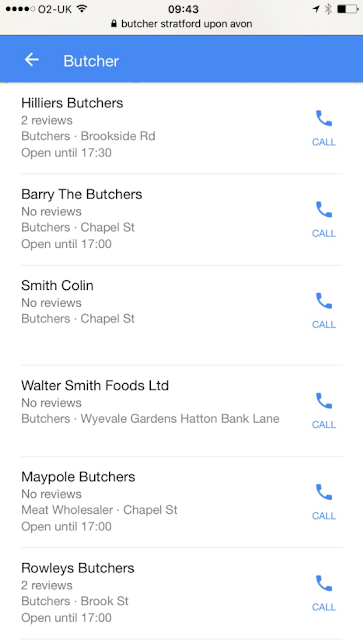 Six butchers, only two with reviews (and they only have two each). So four reviews in total between six businesses. Now Stratford is a pretty well-off part of the country, but she (and we) cannot believe that none of these butchers couldn't do with just a few more customers (after all there is plenty of competition in the shape of thriving supermarkets with meat counters). It's the same story, but this time the supermarkets (and a wholesaler) are showing. There are, according to Google, no independent grocers in Stratford. Actually, there is at least one (found on foot)! 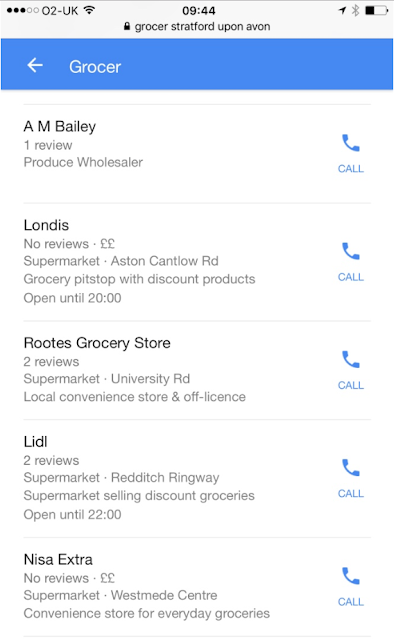 Independent grocers complain about being put out of business by the likes of Lidl, but they don't appear to be addressing their online presence (mind you, nor do Lidl). 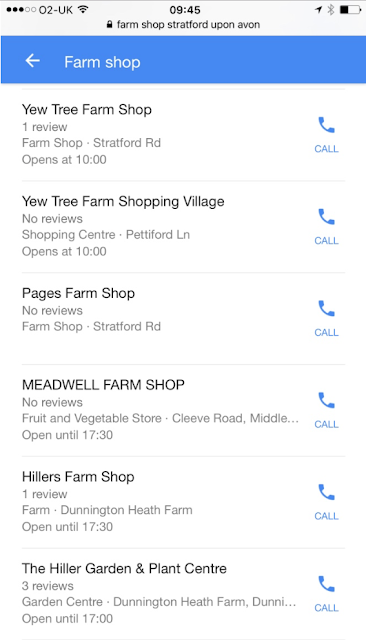 Discounting The Hiller Garden & Plant Centre (eating potted plants might smack of desperation) there are five farm shops being shown in this mobile search - and just two reviews. The single review for Hillers Farm Shop did not help a lot (despite giving them five stars) as it praised their 'fantastic bird hut'. The one for Yew Tree is simply a rating - there is no review. The point of all of this is that in no case were there enough reviews to even vaguely tempt our shopper to explore further (even visit their websites? ), let alone visit any of these shops. She ended up doing it the old-fashioned way: stopping in Stratford town center and asking a likely passer-by for a recommendation. 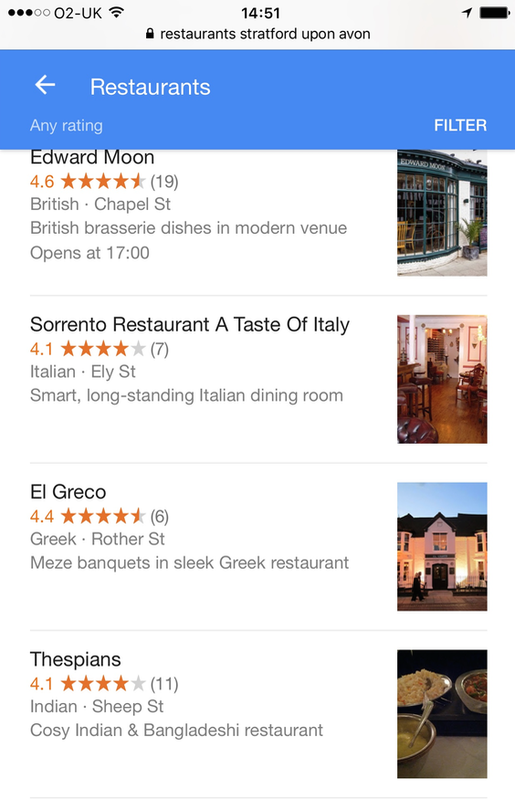 Restaurateurs - don't be too quick to pat yourselves on the back - how many covers have you served since it became possible to leave a review on Google (and more importantly - since Google became the first reviews your potential customers see)? So much for the web revolutionising the way we shop! Google (and reviews) have been around for long enough now that one might think that businesses had got the hang of it. We're not looking for thousands of reviews here, just enough for consumers to be able to form enough of an impression to at least visit the business's website. And don't think that Stratford is not typical, a cursory search of your home-town is likely to come up with similar results (and no different for other trades and professions). There is a yawning gap here, just waiting to be filled by any enterprising business that wants to grow trade. Businesses have been generally slow to see the opportunity Google reviews present: and the first to take it will look great by comparison, especially when Google begins to rank trades in their area (for more details read this). Get Dialogue working for you, it will drive lots of reviews to your website and a steady stream of those onwards to Google. Soon you will look great in both places. Speak to Fiona Christie on 020 7100-2233 or email her at fiona.christie@helphound.com - she will answer all your questions.